I finished it in the middle of last month, well ahead of schedule, but the clean out (still progressing) was in the stage where a lot of thing get piled on other things and it vanished into a stack of other stuff. I have been thinking about groups of things and rhythms across a piece. I also wanted to know exactly how many of a thing I had made. 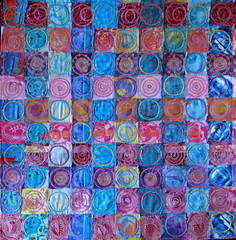 I wound up with this grid of 100 squares of woven fabrics – 10 pink, 10 blue, – held together with the embroidered circles at each intersection. All the original ideas had elaborate plans for patterns within patterns following each fabric across the page, but as I started the embroidery process I realized I wanted it simpler than that. I am pleased with the object as is, I am also thinking I could chop it up into business cards, to really put the final, performance, spin on the answer to "so what is it you do? exactly?" oh you busy bee, multiplying thoughts behind the scene! I haven’t done much looking at the TIF blog – but each month, your work seems to be one of the ones I linger over, May’s piece being no exception. …. capture perfectly my inability to explain what I do. Who I am and what I do are the same. I like all the circles embroidered over the squares, this is a very effective piece. It was the one piece I chose to click on of about 15 thumbnails that were visible on the flickr page today. Great colors too. I think this is beautiful – very vibrant, and I like the variations in the circles. Brave to think of chopping it up – yet what a finale!